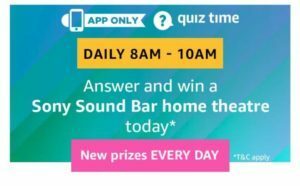 Amazon Quiz Time ( Daily 8 am- 10 am ) is another Quiz Strategy in which you can win exciting prizes such as Sony home theatre, etc. Today they are offering a quiz based on Sony Sound Bar Home Theatre. Amazon Quizzes are not that hard to crack and have just five questions. If you are looking for Answers to Today’s Amazon Quiz, you are at right Place. We have added all the answers in a single post. Enjoy now..!! This Quiz is valid for 8 am – 10 am on 20th July 2018. How to Participate and win Win Sony Sound Bar Home Theatre in Amazon Quiz Time? 2. Open the app and you will see a banner about the Oppo F5 quiz. Click on it. Q 1. Sophia is an AI robot, and the first one to get citizenship from any country. Which country granted her its citizenship? Q 2. In the series ‘Game of Thrones’, the White Walkers are vulnerable to which of these materials? Q 3. Vader, Papi, Tatay, and Tevas are different terms for a ____. Fill in the blanks. Q 4. According to the old English proverb, to which European capital city do all roads lead to? Q 5. In the FIFA World Cup, the ‘Golden Boot Award’ is awarded each season to whom? 5. After answering all 5 questions correctly, you will get a Congratulations message that you have been entered into a lucky draw. Now keep your fingers crossed and wait for the results. The declared winner(s) will be eligible for winning a Sony HT-RT40 5.1 Channel Sound Bar Home Theatre System (hereinafter referred to as “Prize(s)”).